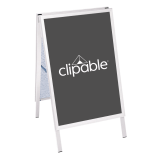 This stylish Clipable A Board has been designed with rounded corners for not only a modern finish, but also as an added safety feature to avoid sharp corners. Pavement signs are a key element in a wide range of businesses and drive in off the street sales or just simply let people know who and where you are for future reference. 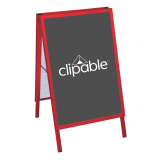 If you are a new business, have a fantastic promotion to offer or are set back from the street and not easy to find, Pavement Signs are for you. They also offer a double sided display, giving you double the advertising space. What is the Pavement sign made of? This Pavement sign is built with galvanised steel back panels for extra stability. The frame is anodised aluminium with a modern smooth satin finish. The A1 board weighs 7.3kg and the A2 board weighs 4.9kg. Is this a snap frame? Yes, this sandwich board features the famous snap frame mechanism! This means you can update your posters quickly and effortlessly. The clip frame opens at the front on both sides to release your protective cover and poster so you can take them out and simply place in your new graphic. Yes, a UV anti-glare PVC cover is included for each side of your display. These specially designed covers will protect your image against general wear and tear and fading from the sun. Do you sell spare poster covers for the A Board? Yes, you can purchase spare PVC poster covers separately. What paper do you recommend using for the poster? 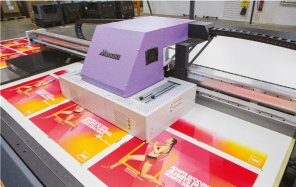 Whilst using normal paper is okay, we highly recommend printing onto polypropylene or another waterproof based paper as this will protect your poster and keep it looking it's best whatever the weather. 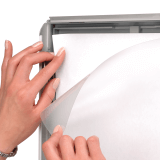 Designed to hold paper with a maximum thickness of 0.5mm. Great board value for money easy to handle. Timely delivery. Very good product. Excellent sales service, arranged replacement of faulty item the next day. Great customer service, prompt delivery and product was just as described.